Sumo, although it is a very simple sport, was surprisingly interesting to learn about and watch. Sumo has always been a part of Japanese history, dating back around 1500 years! The history, including rituals and ceremonies, surrounding sumo is more complicated than the sport itself! The way sumo wrestling is played is quite simple: once contact has taken place, the first wrestler to touch the ground with anything besides the feet or step out of the boundaries of the circle loses the match. Sumo is single elimination, so each game is won by only one match. Before the match begins, however, each wrestler must mentally prepare to face their opponent. This is done by doing a few things. First, the wrestlers will meet at the center of the circle, behind the thick wooden line, to crouch and stare at one another. Then they will step back to their corners, perhaps wash their faces or take a drink of water, and then face their opponent again. They will most likely step back again, possibly stomp their feet on the ground ritually, slap their belly, and/or throw salt into the arena. Then they will crouch and stare again. This can go on for up to four minutes before they are required to start the match. Each action has a meaning behind it. Rinsing the mouth with water is meant to cleanse mind and body, throwing salt into the arena is meant to purify it and rid them of injury, and stomping is meant to show higher ranking. Most of all though, I just enjoyed watching them throw each other around with great force! Shibuya was the city that I traveled to the most often on my trip in Japan. 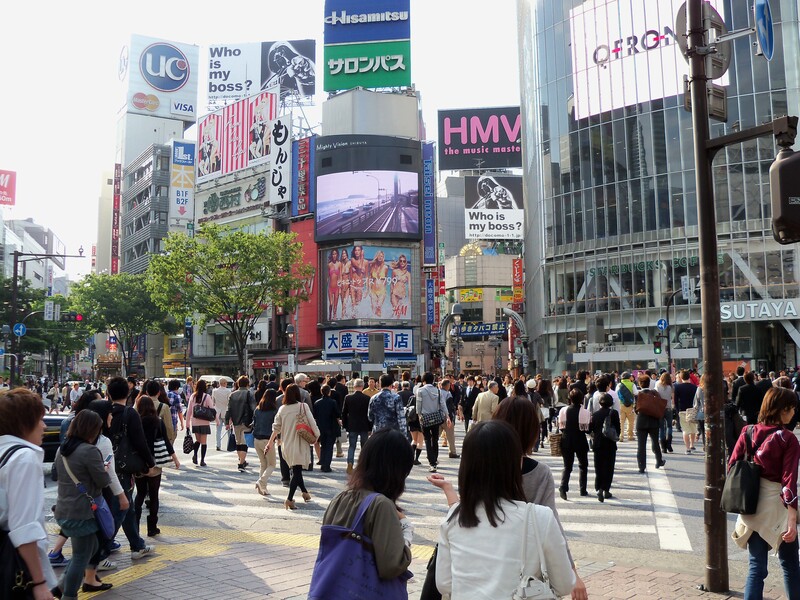 Shibuya offered a very exciting nightlife, as well as a short travel distance from our hotel. It was here that I saw the famous Shibuya scramble crossing! This picture doesn’t even compare to what it’s like at night! An average of 3000 people cross this intersection when vehicle traffic stops, which is amazing to watch from the Starbucks built into the media store across the street. My first experience with Azuki was in Shibuya, which is a sweet bean. The azuki I tried was inside a fish-shaped waffle! Man who served me my fish-waffle! While wandering around Shibuya, I walked by some strange attractions that triggered my curiosity. It wasn’t until I went to Shibuya with Jared Wilk’s brother that I gained a better understanding of Japanese prostitution and love hotels. I’m not about to describe them on my blog, so if they make you curious as well, click on the links to read on! It was also in Shibuya that I had my first Japanese karaoke experience! 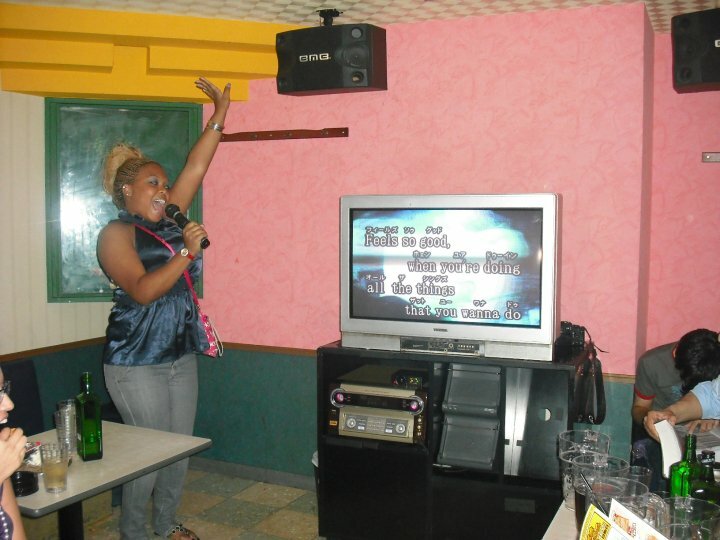 Unlike karaoke in America, where you sing at a restaurant or bar, embarrassing yourself in front of every person in the joint, Japanese karaoke requires you rent a room with a group of friends, and sing in the privacy and comfort of people who already know how terrible your voice is. Shibuya is the city to go to for just about any weekend entertainment, and I will always love it for that reason! The living conditions in major cities like Tokyo and Osaka were very compact! As I mentioned before, walkways were often so compact that pedestrians or bikers would just venture onto the street to move more quickly and efficiently. But compact lifestyle in the city goes beyond just that. Vehicles were generally tiny, even if they were vans or trucks! At one point when our group was looking for a place to eat, we happened upon a fire truck, and it was the cutest fire truck I had ever seen! Many of the stores and restaurants were compact as well. Japanese cities utilized multiples levels of a building to house many businesses. Signs on the wall would indicate what business was on which level of the building. Some stores would be very tiny in depth, but operate on multiple levels. I loved how the tiny stair cases would make me dizzy! Parking structures amazed me. They worked like car elevators, lifting the car into a designated stop and storing it. Later, when you came to pick up your car, it would be brought back down via the same machinery, backed out onto a rotating platform, and then rotated to face the road! Even the residential houses were compact! But if you REALLY want to see compact, check out this video! 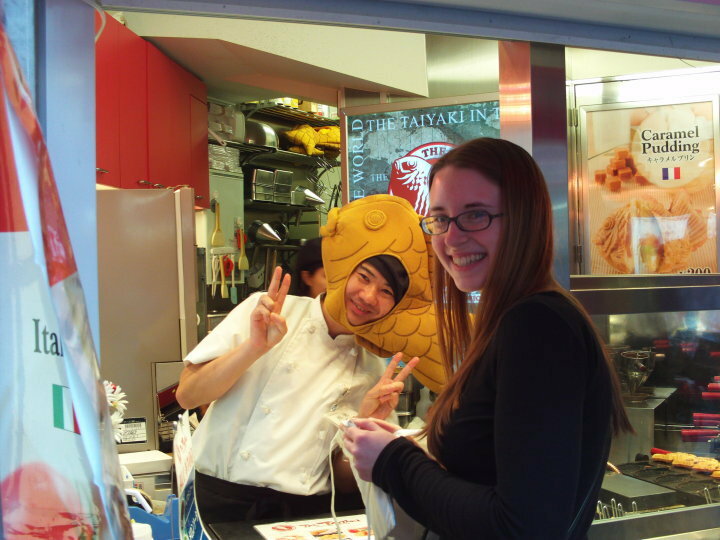 Food in Japan was an adventure for me everyday. I worked toward finding new and unusual foods I could try, but I was not brave enough to try them all! The first night of our stay, Dr. C took us out to a restaurant and ordered us many unusual dishes. I managed to try the octopus ball, which was fried octopus mixed with a tasty sauce. I quite enjoyed it! Later on our trip we went to a festival, and many of the concession stands had some interesting snacks. 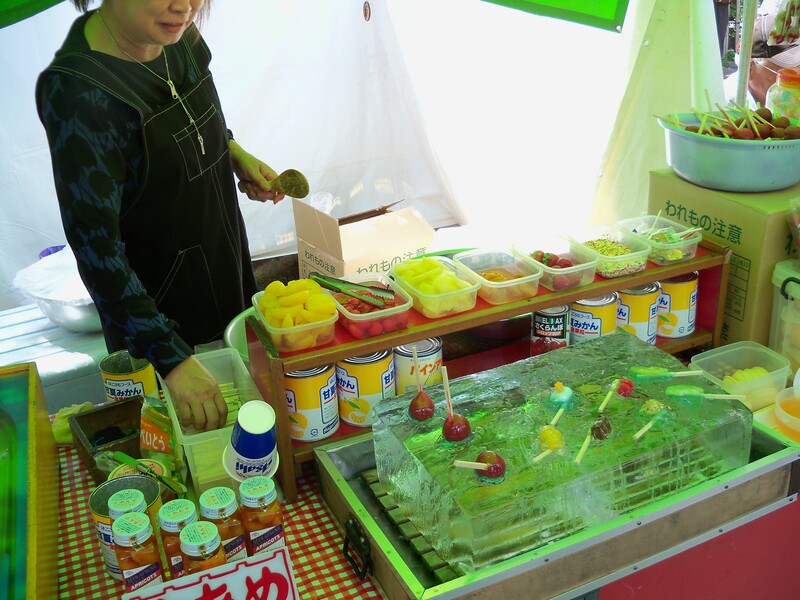 One I liked had pieces of fruit that they stuck on a stick and then placed on a block of ice to freeze over. 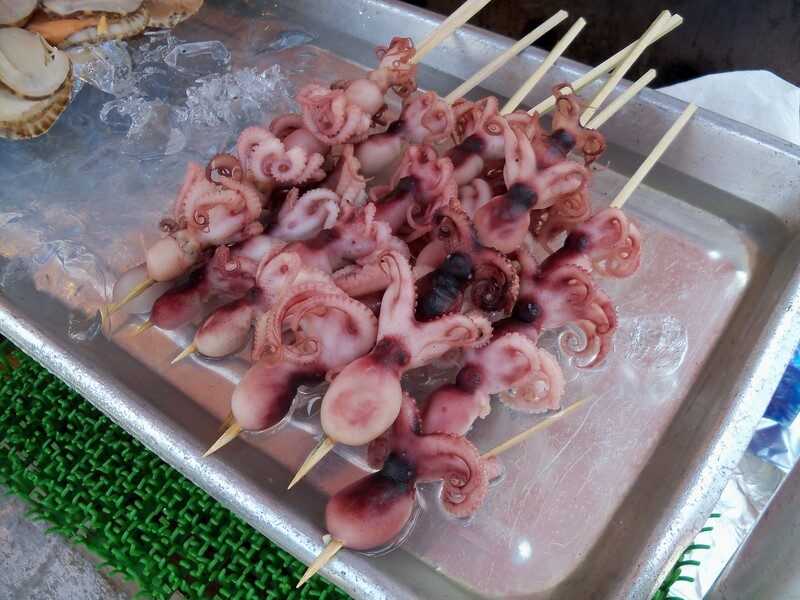 One I didn’t appeal to me so much a mini octopi on a stick, like a kabob! When our group visited Mt. 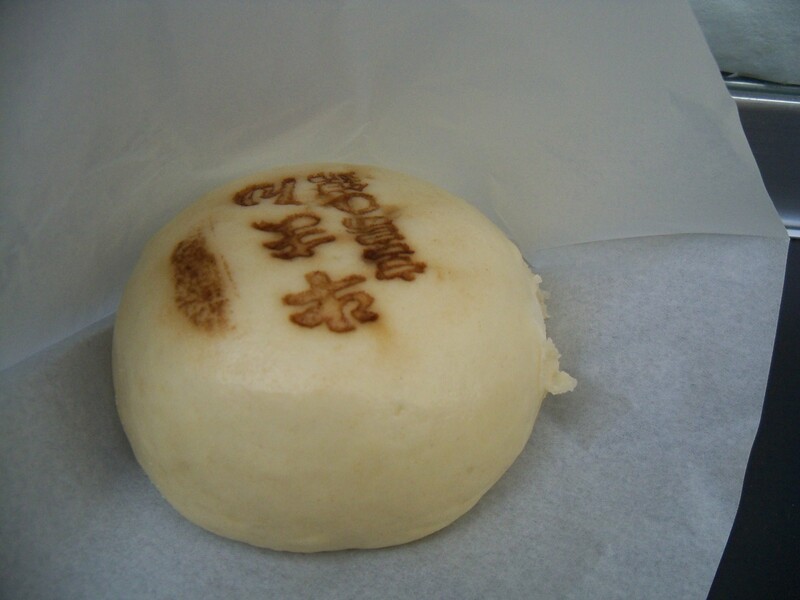 Shosha, the set for the movie The Last Samurai, I tried a delicious dough ball filled with beef. But the strange cultural concoction I enjoyed the most was Okonomiyaki. 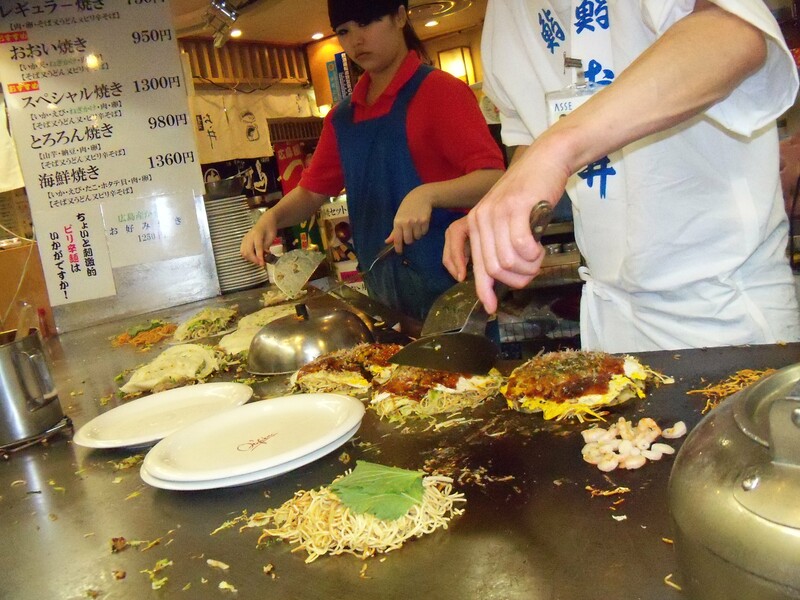 This Japanese pancake is topped with lettuce, noodles, meat/seafood, eggs, and sauce! Such a strange combination of items, yet incredibly delicious! The second university we visited was Waseda University, which is like the Harvard for America. It often takes students a couple years to get accepted into the university, but once they get in, the workload is very lax. Students take an average of 9-11 classes per semester, which seems like a lot, but they only meet for 90 minutes a week for each class, and are not expected to take on a large workload. Athletes are given even more of a break, as it is acceptable for them to show up late and snooze during class. It’s also not uncommon for college students to skip class as well. The professor explained to us that the scholarly asian student stereotype was probably created in America of immigrant students pushed by their parents to bridge the gap and succeed in a foreign country. In Japan, students work their hardest in high school, in order to get accepted into college, but college is considered their time to relax before going out into the workforce. The professor also explained to us that Japanese is a language that takes quite awhile to learn and get used to, unlike a European language such as Spanish or French. Our study abroad group got the opportunity to go to a maid café while in Akihabara the concept behind these cafes is simple- your servers are all female, similar to hooters except instead of trying to appear sexual, maid cafe servers aim to look and act cute. This is similar to the concept of the video game I mentioned earlier, Dream C Club, where men play the game to feel a sense of warm love for a sister or daughter, rather than for sexual appeal, The “maids” wear dressed similar to maid attire in America only more colorful and elaborate. They also wear lots of make-up, accessories and style their hair to look very cute. The maid café we went to had a 500 yen cover charge for their unique services which is about 5.50 USD. The items on the menu are primarily alcoholic cocktails along with various other beverages, desserts, and some meals. The prices of these items are inflated, similar to alcoholic drinks ordered in bars. The price of the unique service is what people pay for. I ordered what looked like an ice cream parfait with chocolate and vanilla ice cream, corn flakes, pieces of fruit and whipped cream. The unique thing about many of the foods that are ordered is the fact that the servers decorate the food with cute faces or symbols. My ice cream had a cute animal face in chocolate fudge. Pvan’s spaghetti had a heart made with the past, and the coffee belonging to the couple next to me was decorated with a whipped cream happy face that the server drew in front of them. The maid café also offers a few other services, such as turning the lights off and performing a song, taking pictures with the maids, and asking each person to do a fun little chant when they bring you your food. Although maid cafes are expensive they offer a very fun and unique experience.